The torch has been lit, and the NephMadness 2018 games has begun! For the 6th year in a row, AJKDBlog is transforming into the headquarters of NephMadness. 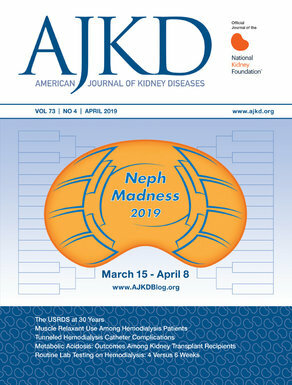 Our actual reply: NephMadness is an online, CME-granting, evidenced-based, noncommercial learning initiative that leverages the tools of social media to teach about the latest and greatest breakthroughs in the field of nephrology! Read these 8 region posts. Take to Twitter. Hit up Facebook. Go to Instagram. Participate in the conversations and controversies happening on social media. Still confused? Check out these previous explainer posts: NephMadness – What’s Up With That? or NephMadness for Dummies. Who determines the outcome of NephMadness? By reading the region posts, US-based physicians can earn 1.0 CME credit per region, up to 8.0 CME credits total. At the end of each post, there will be a link and instructions to register and log in to the NKF PERC in order to complete your evaluation and print your certificate. You will be required to evaluate each region individually, so our best advice for you is to do the evaluation after reading each region. In plain language: Read Region A, then complete the form for Region A. Read Region B, then complete the form for Region B. The CME activity will expire on June 15th, 2018, so don’t procrastinate if you need to claim the credits! There are 2 categories: Highest Score and Most Entries. When you submit your bracket, there is a question asking whether you are part of a group or whether you are submitting a group entry. For both Group Prizes, the maximum number of hats awarded will be 25 per group (meaning more than 25 individuals can be affiliated with a group, but we will only award 25 hats per group). Let’s use the example of the Puppy Fellowship program at the University of Cute Puppies (UCP). The fellows got together, filled out a group bracket, and submitted it under “Puppy Fellowship OFFICIAL” (yes, please add “OFFICIAL” so we know it’s an official group bracket). That’s ONE bracket that will be considered for the “Highest Score” Group Prize. However, each fellow can also submit their own individual bracket. Maybe they weren’t there when the group bracket was discussed or maybe they disagreed with the final group bracket. When they submit their own bracket, they should say they are part of the “Puppy Fellowship of UCP” group (please try to use a standard group name so it’s easier for us). The “Most Entries” Group Prize will have multiple brackets that have affiliated themselves with the same group. Each individual can submit up to two brackets. In years past, we’ve had a lot of healthy and friendly debate on #NephTwitter. Make sure to follow these organizers and be engaged throughout #NephMadness 2018! 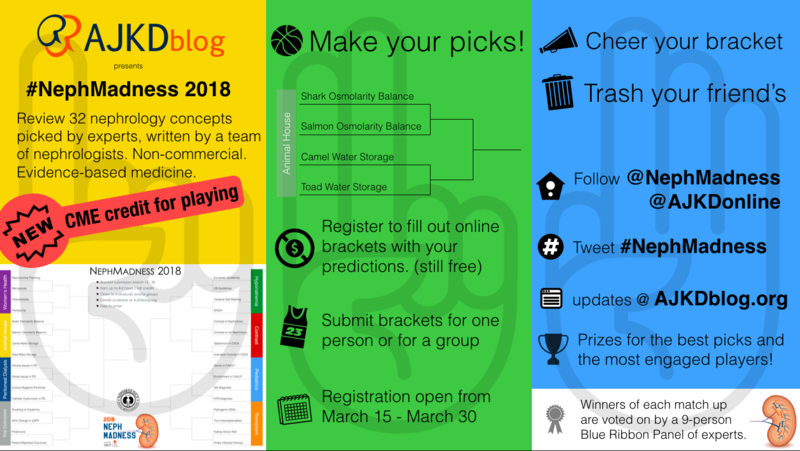 Updated March 15th to include NephMadness 2018 information such as regions and brackets.